Generics and Biosimilars Initiative Journal (GaBI Journal). 2012;1(1):8-12. Introduction: Switching from originator products to generic equivalents is a key method used by governments to reduce costs and keep their healthcare systems sustainable. The aim of this article is to review generic medicine pricing in Europe by analysing the factors that influence them. Methods: The literature review focused on selected studies that highlighted generic medicine pricing in ambulatory care in Europe. PubMed, the Centre for Reviews and Dissemination databases, Cochrane Database of Systematic Reviews, and EconLit were searched up to August 2011. Search terms included, ‘pharmaceuticals’, ‘generic medicines’, ‘Europe’, ‘pricing’, ‘discount’, and ‘rebate’. Bibliographies of included studies were checked for relevant studies and the status of generic medicines pricing in Europe was also documented via accessing the European Generic medicines Association market survey. Results: Ex-manufacturer prices for generic medicines were found to vary substantially between European countries, which suggests that pricing not only reflects production costs, but is also influenced by the domestic regulatory environment. The penetration of generic medicines is more successful in countries that permit free pricing of medicines than in those that have price regulation. Although tendering systems may reduce (generic) medicine prices in the short term, little is known about the overall long-term impact of such systems. Conclusion: No single approach towards developing generic medicine pricing policies and attaining cost savings was evident. Generic medicines are a key instrument for governments to sustain their healthcare systems and control pharmaceutical expenditures. This contribution of generic medicines to the sustainability of European healthcare systems has been recognised by the High Level Pharmaceutical Forums, ‘Generic medicines provide an opportunity to obtain similar treatments at lower costs for patients and payers, while liberating budgets for financing new innovative medicines’ . WHO also emphasises the cost-saving potential of switching consumption from originator products to generic equivalents . This underlines the importance of gaining insight into generic medicine pricing in Europe, where pricing is an area of national responsibility of the EU Member States. The aim of this brief article is to review generic medicine pricing in Europe. This will be achieved by providing evidence concerning the generic medicine price levels in Europe and the factors that influence price levels and by providing an insight into the international literature on generic medicine pricing policies and their impact. When addressing generic medicine pricing policies, this article focuses on free-pricing systems versus price-regulated systems, reference pricing, price competition and discounts, and tendering procedures. This literature review did not focus on summarising and assessing all relevant studies, but rather drew on personally selected studies about generic medicine pricing in Europe. As such, this literature review was not systematic. Studies were identified by searching PubMed, Centre for Reviews and Dissemination databases, Cochrane Database of Systematic Reviews, and EconLit, up to August 2011. Additionally, the bibliography of included studies was checked for other relevant studies. Search terms included pharmaceuticals, generic medicines, Europe, pricing, policies, regulation, market, competition, reference pricing claw-back, tendering, discount and rebate alone and in combination with each other. The literature review was restricted to generic medicine pricing in ambulatory care in a European country. Studies of generic medicine pricing in the hospital setting were excluded. Studies could be published in Dutch, English, French, German or Italian. Studies published prior to January 2000 were not included as this is a rapidly changing field. Additionally, the market survey conducted by the European Generic medicines Association was accessed to document the status of generic medicine pricing in Europe in 2011. Professor Simoens conducted an international comparison of ex-manufacturer prices of generic medicines in ambulatory care in 2005 . Data on generic medicine prices of 15 molecules/strengths were derived from IMS Health. The analysis was limited to medicines in immediate release, oral, and solid dosage forms. Prices were compared between nine European countries (Belgium, Denmark, France, Germany, The Netherlands, Norway, Spain, Sweden and UK) and with India. India was included because the European generic medicines industry has been facing competition from Indian firms which benefit from lower labour and production costs, and weaker patent protection laws. Ex-manufacturer prices, i.e. the price at which a pharmaceutical company sells medicines, for generic medicines varied substantially between European countries. For instance, generic medicine prices in the Scandinavian countries were substantially lower than prices in countries such as France, Germany, The Netherlands or UK. Such European variation suggests that the prices of generic medicines not only reflect underlying production costs, but are also influenced by the domestic regulatory environment surrounding registration, pricing, reimbursement and distribution of generic (and originator) medicines. This illustrates the importance of domestic healthcare policies in the pricing strategies of manufacturers. For instance, the introduction of the ‘manufacturer’ and ‘wholesaler’ schemes in UK in 2005 (which purported to increase generic medicine pricing transparency) reduced generic medicine prices by 32% in the first year following policy implementation [4, 5]. This study also indicated that the lowest ex-manufacturer prices of generic medicines were observed in India. Imports from India are likely to put downward pressure on generic medicine price levels in Europe. Indeed, Indian generic medicine prices could give an indication of how much generic medicine prices in Europe could drop in the future. Generic medicine pricing not only varies between European countries, but it can also differ between medicines within a single country. Adriaen et al. examined the evolution of the retail price of originator and generic medicines from July 2001 to December 2005 in Belgium . Price levels in the Belgian off-patent market were influenced by a large number of issues such as successive reductions in reference prices and prescription status of medicines; by market incentives in the form of price competition between generic medicines, competition between originator and generic medicines or price agreements between originator and generic medicines; by medication class; and by the market power of the originator medicine. A recent study investigated whether there is a relationship between the market share of generic medicines and the price level in European off-patent markets . Data on 35 oral active substances were derived from IMS Health. Medicine values were calculated on the basis of ex-manufacturer prices. The analysis included countries with a high market share of generic medicines (volume of 40% or more) as well as countries with a low market share of generic medicines (volume of 20% or less), see Figure 1. Data used were from June 2002 until March 2006. The authors calculated the evolution of off-patent market values, i.e. price x volume, of 35 selected active substances. The decrease of market value in markets with a high share of generic medicines was more substantial (−26.6%) than the decrease in markets with a low share of generic medicines (−0.06%), although this was not statistically evaluated. In high generics market share markets, medicine prices dropped by −43.18% and in low market share markets by −21.56%. Thus, the extent to which price competition from generic medicines leads to price reductions appears to vary according to the market share of generic medicines. Markets with a high market share of generic medicines tended to see a larger decrease in medicine prices than markets with a low market share of generic medicines. This observation suggests that the generic medicines industry is able to deliver competitive prices if it is ensured a high market share of the off-patent market. This high market share is dependent on demand-side policies. On the one hand, countries with a high market share of generic medicines have incentives in place for physicians, pharmacists, and/or patients to demand generic medicines. On the other hand, there are few incentives to stimulate demand for generic medicines in countries with a low market share of generic medicines . This is corroborated by recent work from Godman et al., which suggests that European countries can enhance prescribing efficiency by implementing measures to lower generic medicine prices in combination with demand-side policies such as prescribing restrictions on originator medicines [9, 10]. European generic medicine pricing systems tend to be: a) a free-market approach, where manufacturers are (relatively) free to set generic medicine prices; b) a price-regulated system, where generic medicine prices are set on a regulatory basis, e.g. by law; or c) a combination of these two approaches, e.g. price regulation for the first generic medicine(s) and a free-market approach for following medicines [4, 11, 12]. In Europe, the reimbursement status of a generic medicine tends to determine which pricing system applies to a product. The literature indicates that penetration of generic medicines is more successful in countries that permit free pricing of medicines than in countries that have price regulation [13-15]. In countries where a free-market approach prevails, manufacturers of originator medicines can charge premium prices both before and after patent expiry, thereby attracting market entry of generic medicines. Manufacturers of generic medicines are engaged in price competition and are able to raise their market share by offering price reductions on their products. As a result, in countries with free pricing, the price difference between originator and generic medicines tends to be higher than in countries with price regulation [14, 16]. In contrast, in countries that rely on regulated prices, regulation drives down the price of the originator medicine over the life cycle of the medicine, thus discouraging market entry of generic medicines . The limited diffusion of generic medicines in such markets restricts price competition following patent expiration, although competition in the form of discounts to pharmacists may occur . In response to this, countries such as France have introduced generics substitution targets to sustain generic medicine market entry and price competition . A market survey conducted by the European Generic medicines Association in 2011 revealed that 80% of European countries imposed price regulation and 20% adhered to free-market pricing . Of those countries with pricing regulation, 37% set the price of generic medicines at a predetermined percentage below the price of the originator medicine, 31% set a maximum price for generic medicines, and 16% based the generic medicine price on the average price of medicines in a selection of European countries. The mechanism used to link the prices of generic and originator medicines may produce the following incentive: if a generic medicine needs to be priced at, for example, 55% or more below the price of an originator medicine throughout its life cycle, as is the case in France, then manufacturers of originator medicines can lower prices in an attempt to drive generic medicines out of the market. The mechanism of price regulation may also have an impact on the extent to which price competition takes place and, hence, can influence generic medicine pricing. A Norwegian study has reported that a reference pricing system, i.e. a system where the regulator establishes a common reimbursement level for a group of interchangeable medicines, stimulated generics competition to a greater extent and led to lower prices than did price-cap regulation, i.e. a system where the regulator sets a maximum price that can be charged for a medicine . The recent literature suggests that mechanisms to regulate prices such as price caps or a reference pricing system reduce prices of originator and generic medicines and may encourage price competition beyond the price reductions imposed by regulation in some countries, e.g. Austria, Lithuania [11, 12], but not in others, such as Slovenia or Spain . The generic medicine price level is likely to be influenced by the operation of a reference pricing system. Given that medicines priced above the reference price are likely to lose market share as a result of the additional patient co-payment, manufacturers have an incentive to price generic and originator medicines at or below the reference price. Also, in some countries such as Belgium, generic medicines need to be priced at or below the reference price if they wish to gain reimbursement . The market survey conducted by the European Generic medicines Association found that 80% of European countries had a reference pricing system in 2011 . When setting reference prices, the majority of countries took into account the prices of existing medicines: the reference price was based on either the lowest priced medicine (47% of countries), the lowest priced generic medicine (21% of countries), the average price of medicines (11% of countries), the average price of generic medicines (5% of countries), or other measures (16% of countries). Reference prices were established by active substance (42% of countries), therapeutic class (31% of countries), pharmacological class (18% of countries), or by another mechanism (9% of countries). By calculating the reference price as a function of the prices of existing medicines, generic medicine manufacturers may have an incentive to compete, thereby driving down (reference) prices of medicines . Nevertheless, it should be noted that competition does not exist in all countries that have adopted this mechanism of setting reference prices. Therefore, in addition to setting reference prices as a function of the prices of existing medicines, some countries have established a fixed minimum price difference between generic and originator medicines, e.g. France, Italy and Portugal . This approach has the benefit of guaranteeing savings to the third-party payer, although it is not clear at what level maximum prices of generic medicines need to be set. The third-party payer will lose out if reimbursement prices of generic medicines are established at a higher level than would have been observed in a competitive market . In some European countries, competition between generic medicine manufacturers takes the form of discounting to the distribution chain rather than price competition. Indeed, two studies found that generic medicine discounts ranged from 20–70% off the wholesaler selling price in France and maximum discounts exceeded 50% of the Drug Tariff price in UK [23, 24]. Retail prices overestimate the value of generic medicines if generic medicines manufacturers compete by offering discounts to the distribution chain. This is because retail prices do not take these discounts into account. In the author’s opinion, the practice of discounting is not clear to market actors and is not fair as wholesalers and pharmacists are not rewarded for services rendered, but rather for their ability to negotiate discounts on artificial prices . Such a system may financially benefit wholesalers and pharmacists, but it is not sustainable in the long run given that countries increasingly compare prices across Europe and given that healthcare payers and patients do not capture the potential savings from a generic medicines market where companies compete on price . In response to this, France has regulated the size of discounts awarded in the distribution chain  and The Netherlands has introduced claw-back mechanisms that aim to recover the discounts that pharmacists receive. The introduction of the ‘Manufacturer’ and ‘Wholesaler’ schemes in UK made the manufacturing costs and discounts more transparent, leading to lower prices for generic medicines . However, this type of government intervention is unlikely to be as efficient as a market mechanism where generic medicine manufacturers compete on the basis of prices rather than discounts to the distribution chain. Price competition between generic medicines manufacturers is transparent and easy for all market actors to understand, and ensures that prices paid by healthcare payers and patients reflect value . For instance, Poland will introduce legislation in 2012 that outlaws discounting to the distribution chain and promotes price competition. However, such legislation also needs to address the issue of pharmacist remuneration as pharmacists are likely to lose an important source of income if discounts are outlawed. Tendering is a mechanism whereby a purchaser buys medicines based on a competitive bidding process where the contract is granted to the pharmaceutical supplier who offers the best bid following strict criteria . Whereas tendering procedures are widely used in the hospital sector, in the last couple of years they are also being rolled out in ambulatory care in an increasing number of European countries with a view to constraining pharmaceutical expenditure . Few data are available to date on the current status and impact of tendering procedures in Europe. The literature suggests that significant pharmaceutical budget savings can be achieved from tenders, but the overall results are unclear . One study pointed to pharmaceutical budget savings as a result of significant reductions in medicine prices in Denmark, Germany and The Netherlands . However, although physicians and patients have incentives (in the form of lower patient co-payment) to demand medicines that are included in the tender in Germany, physicians still have the right to write ‘do not substitute’ on the prescription form. Furthermore, the Belgian experience indicates that tendering produced savings for one specific medicine, but these savings were offset by the fact that physicians switched their prescribing patterns to medicines with a similar therapeutic indication that did not fall under the tendering procedure, so-called ‘re-allocation of demand’, and total expenditure actually increased . Countries that have implemented tendering procedures have sometimes witnessed a decrease in pharmaceutical investments, a slowdown in the development of the generic medicine market, short-term absences of some medicines due to logistic shortages, a reduction in pharmacist remuneration, and problems with patient compliance . Finally, tendering systems in countries such as Germany are regionally based and are initiated between individual sickness funds and pharmaceutical companies and, therefore, are less transparent than in countries such as Belgium, which has a national tender. Using evidence from the literature on generic medicine pricing in Europe, this article suggests that competition from Indian generic medicine manufacturers, international comparisons of generic medicine prices, some mechanisms to set (reference) prices, and efforts to move away from competition by discount to competition by price are likely to put pressure on generic medicine prices in European countries and to generate additional savings to healthcare payers and patients. These savings may depend on the implementation of a free-market approach because more generics competitors tend to enter the market and price competition is stronger in less-regulated markets. Although tendering systems may reduce (generic) medicine prices in the short term, little is known about the overall long-term impact of such systems. Once the patent of an originator medicine expires, generic medicines can enter the market. Generic medicines have the same quality, safety and therapeutic efficacy as the originator medicine, but are less expensive than originator medicines. In an era of ageing populations and rising healthcare costs, generic medicines allow patients to access safe, effective, high quality medicines at 20–80% of the price of branded originator medicines. No sources of funding were used to assist in the preparation of this manuscript. The author has no conflicts of interest that are directly relevant to the content of this manuscript. 3. Simoens S. International comparison of generic medicine prices. Curr Med Res Opin. 2007 Nov;23(11):2647-54. 4. Godman B, Shrank W, Wettermark B, Andersen M, Bishop I, Burkhardt T, et al. Use of generics – a critical cost containment measure for all healthcare professionals in Europe? Pharmaceuticals. 2010;3:2470-94. 5. McGinn D, Godman B, Lonsdale J, Way R, Wettermark B, Haycox A. Initiatives to enhance the quality and efficiency of statin and PPI prescribing in the UK: impact and implications. Expert Rev Pharmacoecon Outcomes Res. 2010 Feb;10(1):73-85. 6. Adriaen M, De Witte K, Simoens S. Pricing strategies of originator and generic medicines following patent expiry in Belgium. Journal of Generic Medicines. 2008;5:175-87. 8. Simoens S, De Coster S. Sustaining generic medicines markets in Europe. Journal of Generic Medicines. 2006;3(4):257-68. 9. Godman B, Shrank W, Andersen M, Berg C, Bishop I, Burkhardt T, et al. Comparing policies to enhance prescribing efficiency in Europe through increasing generic utilization: changes seen and global implications. Expert Rev Pharmacoecon Outcomes Res. 2010 Dec;10(6):707-22. 10. Godman B, Sakshaug S, Berg C, Wettermark B, Haycox A. Combination of prescribing restrictions and policies to engineer low prices to reduce reimbursement costs. Expert Rev Pharmacoecon Outcomes Res. 2011 Feb;11(1):121-9. 11. Garuoliene K, Godman B, Gulbinovic J, Wettermark B, Haycox A. European countries with small populations can obtain low prices for drugs: Lithuania as a case history. Expert Rev Pharmacoecon Outcomes Res. 2011 Jun;11(3):343-9. 12. Godman B, Burkhardt T, Bucsics A, Wettermark B, Wieninger P. Impact of recent reforms in Austria on utilization and expenditure of PPIs and lipid-lowering drugs: implications for the future. Expert Rev Pharmacoecon Outcomes Res. 2009 Oct;9(5):475-84. 13. Martikainen J, Kivi I, Linnosmaa I. European prices of newly launched reimbursable pharmaceuticals–a pilot study. Health Policy. 2005 Nov;74(3):235-46. 14. Schulz A. Evolving dynamics of US and European generics markets. Journal of Generic Medicines. 2004;2(1):23-32. 15. Dylst P, Simoens S. Generic medicine pricing policies in Europe: current status and impact. Pharmaceuticals. 2010;3:471-81. 16. Magazzini L, Pammolli F, Riccaboni M. Dynamic competition in pharmaceuticals. Patent expiry, generic penetration, and industry structure. Eur J Health Econ. 2004 Jun;5(2):175-82. 17. Sermet C, Andrieu V, Godman B, Van GE, Haycox A, Reynier JP. Ongoing pharmaceutical reforms in France: implications for key stakeholder groups. Appl Health Econ Health Policy. 2010;8(1):7-24. 18. European Generic medicines Association. 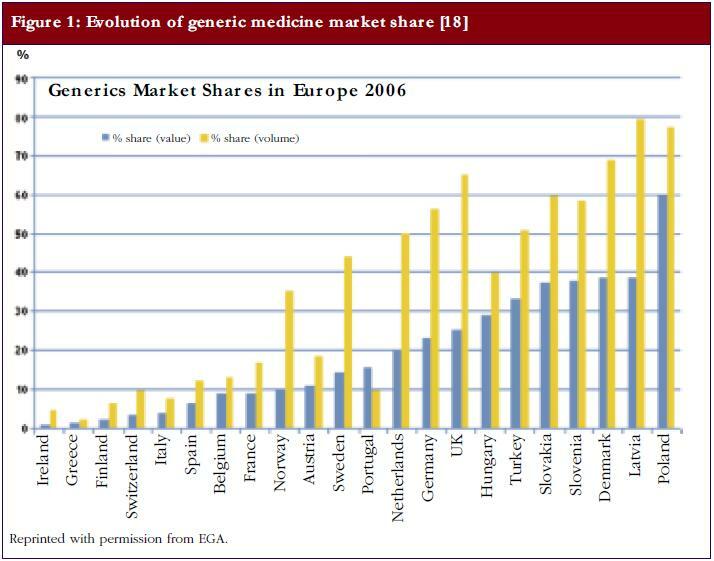 2011 market review: the European generic medicines markets. Brussels: European Generic medicines Association; 2011. 19. Brekke K, Grasdal A, Holmas T. Regulation and pricing of pharmaceuticals: reference pricing or price cap regulation? European Economic Review. 2009; 53:170-85. 20. Puig-Junoy J. Impact of European pharmaceutical price regulation on generic price competition: a review. Pharmacoeconomics. 2010 Aug 1;28(8):649-63. 21. Fraeyman J, Van Hal G, De Loof H, Remmen R, De Meyer G, Beutels P. Potential impact of policy regulation and generic competition on sales of cholesterol lowering medication, antidepressants and acid blocking agents in Belgium. Acta Clinica Belgica. Forthcoming 2012. 22. Simoens S. Generic medicine pricing in Europe: current issues and future perspective. Journal of Medical Economics. 2008;11:171-5. 23. Kanavos P. Do generics offer significant savings to the UK National Health Service? Curr Med Res Opin. 2007 Jan;23(1):105-16. 24. Kanavos P, Taylor D. Pharmacy discounts on generic medicines in France: is there room for further efficiency savings? Curr Med Res Opin. 2007 Oct;23(10):2467-76. 25. Simoens S. Trends in generic prescribing and dispensing in Europe. Expert Rev Clin Pharmacol. 2008;1(4):497-503. 26. Leopold C, Habl C, Vogler S. Tendering of pharmaceuticals in EU Member States and EEA countries. Results from the country survey. Vienna: ÖBIG Forschungs-und Planungsgesellschaft mbH; 2008. 28. Dylst P, Vulto A, Simoens S. Tendering for outpatient prescription pharmaceuticals: what can be learned from current practices in Europe? Health Policy. 2011 Jul;101(2):146-52. 29. PricewaterhouseCoopers. Ontario public drug programs competitive agreement initiative. Ottawa: PricewaterhouseCoopers; 2007. 30. Arickx F, Bormans V, Leveque F, Mortier M, Soete E, Vanhaeren E. Public tendering for off patent medicines in Belgium – the simvastatin case. Brussels: RIZIV/INAMI; 2009.